I’m second to no-one in my slavish adoption of the latest food trends. I like to be first in the queue and in the know about what’s up and coming. It’s a bit juvenile but as a man of a certain age it’s better than buying a motorbike. But somehow the Nikkei food thing passed me by when it first hit London. For the uninitiated Nikkei cooking is the happy marriage of South American and Japanese cuisines which first became visible on these shores with the opening of Nobu and the celebrity hype that surrounded the restaurant meant that the provenance of the food got slightly lost in the PR fog; it is only with the latest generation of Nikkei restaurants such as Chotto Matte that I have started to realise that the cuisine is a distinct entity rather than a subsection of Japanese food culture. I have never really understood the connection between Japan and South America. In his book on Nikkei Cuisine, Chef Luiz Hara, who had wisely given up banking for the much more reliable career of cooking, lays out an eloquent exposition of the cultural and gastronomic journey of the Nikkei, the Japanese diaspora. It’s a fascinating journey that intertwines his family history with the complex picture of mass Japanese emigration. The book features over 100 recipes including guest recipes from some of the best Nikkei chefs around the world. 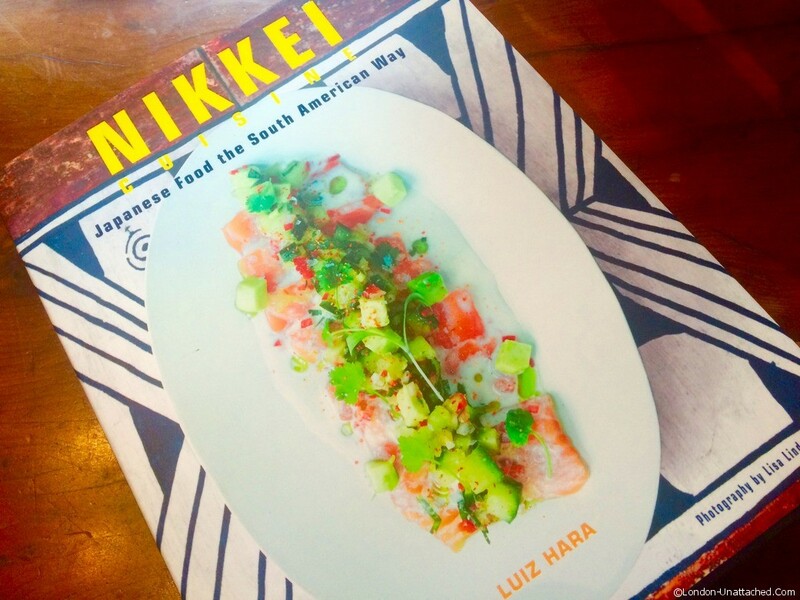 if you’re not familiar with Japanese, Peruvian and Brazilian cuisine the food may seem rather exotic because of the unfamiliarity of the ingredients and techniques but the recipes looked great and read well. However, the raison d’être of a cookbook has to be the cookability of the dishes so I decided to take the plunge and lose my Nikkei cooking virginity. Could I transform my Sussex kitchen into a small corner of Lima? The dish I chose was a salmon and passion fruit tiradito as I love passion fruit and was excited to combine it with a fish. 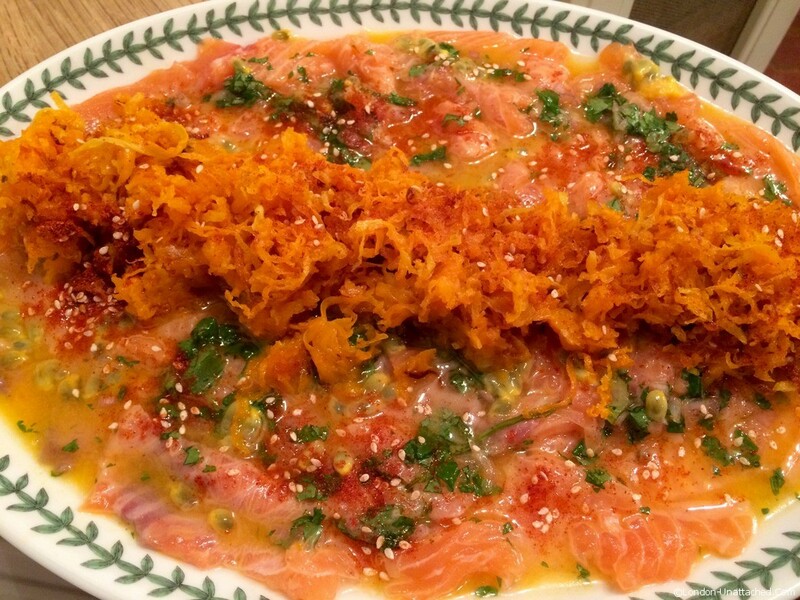 A tiradito is a plate of raw fish presented in a similar manner to the Japanese dish of sashimi with a citrus ‘leche de tigre’ or tiger’s milk added at the end leaving the fish raw. It is similar but different to a ceviche, the classic Peruvian raw fish dish, which is chemically ‘cooked’ in the citrus juice. 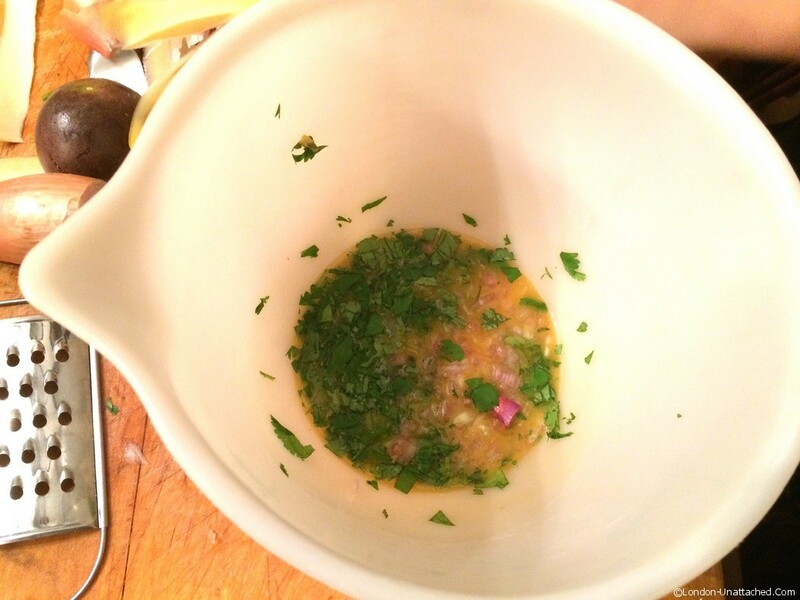 My first challenge was to source some unfamiliar ingredients. I was lucky enough to have some mirin (rice wine vinegar) and aji amarillo paste (a South American hot yellow pepper) in the store cupboard but if you don’t most big supermarkets will stock mirin and Encona have a new range of sauces including an aji amarillo one which I can recommend. The one ingredient I couldn’t lay my hands on was schichimi pepper for which I substituted a mix of sesame seeds and paprika. 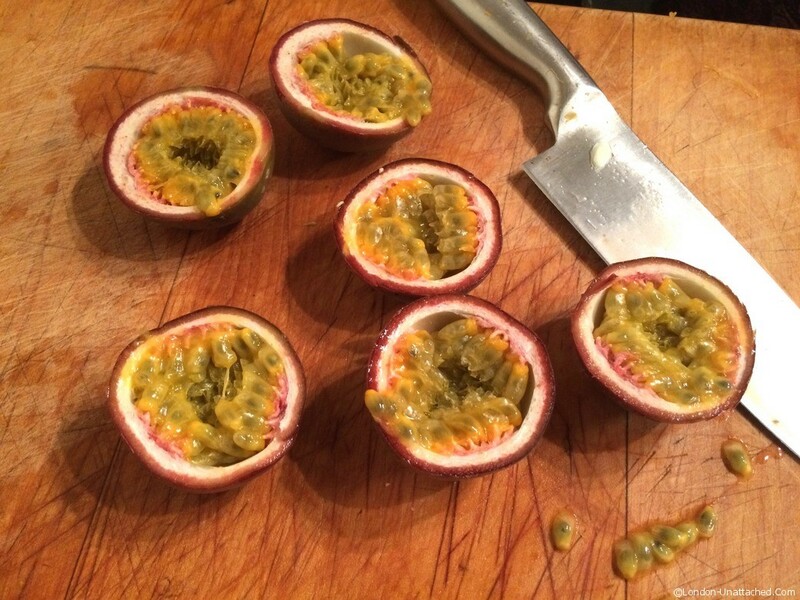 The blending of the passion fruit ‘leche de tigre’ was straightforward as was the slicing of the salmon although you need a really sharp knife. 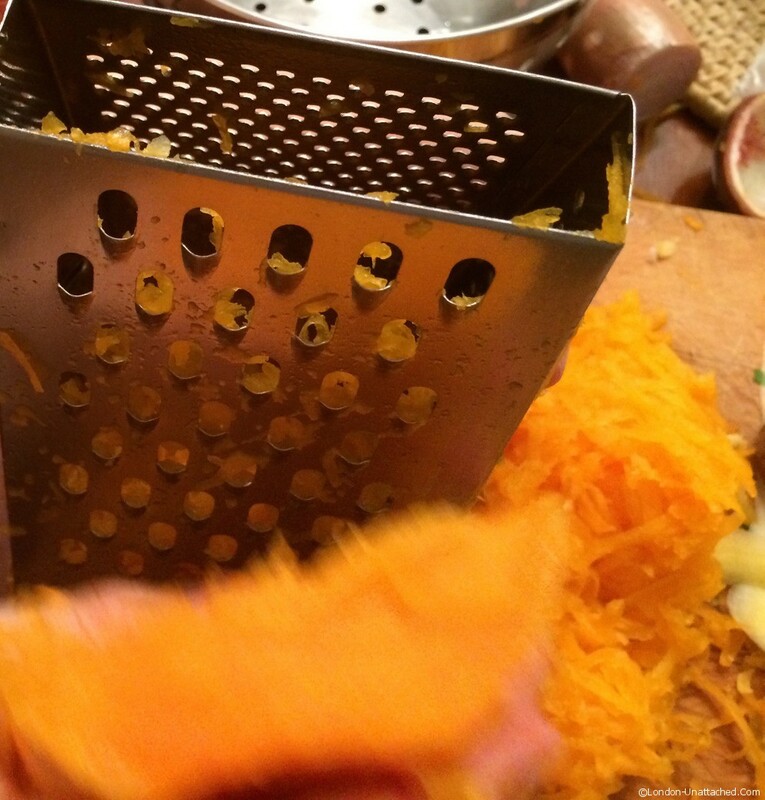 The deep-fried butternut squash strips were a slightly trickier proposition and need to be done in small batches to ensure crispness. The final job was to assemble the dish. It tastes great. The sweet-sour of the passion fruit was a great counterpoint to the richness of the salmon; the mild chilli kick of the aji amarillo was softened by the coriander and the crunch of the butternut squash gave the dish a real textural contrast. Great cook books should not only contain great recipes but also tell a story. It can be the the story of a nation or a family, a region or an individual, a restaurant or a culture . What matters is the connection between the narrative and the recipes. Luis Hara has managed to share his family’s story through the medium of food and we are all the better for it. If you are interested in exploring different food cultures you should buy this book-it would make a great Xmas present! Disclaimer: A copy of this book was sent to London-Unattached for review purposes. This feature contains affiliate links.